Just a little dialog for talking and translating in "leet-speak". To launch it, either type in /dleet or right-click a window and hit 'Leet Translator'. Right click a window and hit 'Turn Leet-Speak ON/OFF' to talk normally in Leet-Speak. 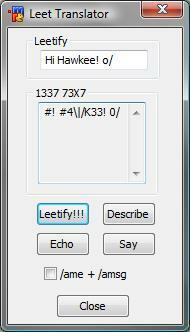 Use /leet [words] to look up a translation from English to Leet-Speak and message the active channel/window. Check the /ame or /amsg to replace messaging or describing into the active channel/window by messaging or describing to all channels/windows. If you're using the dialog, make sure you translate your text into leet FIRST!. Should I also make an identifier called $leet (really the same thing as 'leetifing' the text and messaging the window or channel with the alias)? Pretty sure you could just make an alias for the leetify button and have the other buttons call the alias if the text hasn't already been leetified.